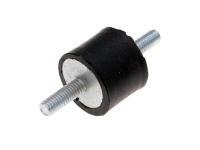 Silent block rubber bearing with 18mm long M6 thread for Polini exhaust system mountings. This device dampens vibrations and should be replaced quickly if it is porous or is knocked out. Only in this way damage to the exhaust system can be avoided by cracks or fractures. The Silent block itself has a diameter of 25mm and is 20mm thick.